NEWS FROM THE FRONT DESK ISSUE No 408: The Wentworth by-election on 20 October is an election like no other. Perhaps a chance to unseat the federal government on the climate agenda. But with 16 contestants, some highly controversial, there’s huge anger in the electorate and even bigger confusion on preferences. GetUP! for the first time (that we know) has opted out of giving a clear direction and instead issued two how to vote cards. One with three options and one with four. Infuriating and unbelievable. That’s how so many people heading to the polls in Wentworth Saturday week will view the comments – or rather non-comments – on climate change made by Dave Sharma standing for the Liberal Party in Malcolm Turnbull’s old seat. In perfect keeping with the party’s increasingly politicised view of climate and the fact that the man he’s hoping to replace in the seat was booted out as prime minister for fear he might lift a tiny finger to tackle carbon emissions, Sharma has consistently refused to say anything about climate except that he supports the Liberal position. Which is to say, do nothing. Towards the end of an OpEd Sharma wrote on Wednesday in The Sydney Morning Herald, filled mostly with motherhood statements and prevarications, he finally mentions climate change. It’s in the third last paragraph. That’s it. No need for a carbon price. No need for a change in government policies. No need to chip in and show leadership. Nope. None of that at all. Our correspondent in the Wentworth electorate, Anne Susskind, said earlier in the week in a story that rocketed straight to No 1, that Sharma had been nowhere to be seen on the hustings. 350.Org’s Blair Palese says he didn’t turn up at Wednesday night’s packed meeting at the Bondi Pavilion, which was focused on climate change. One Liberal did though, John Hewson, and he near brought the house down, according to Palese. So did climate campaigner Geoff Cousins and several of the candidates. 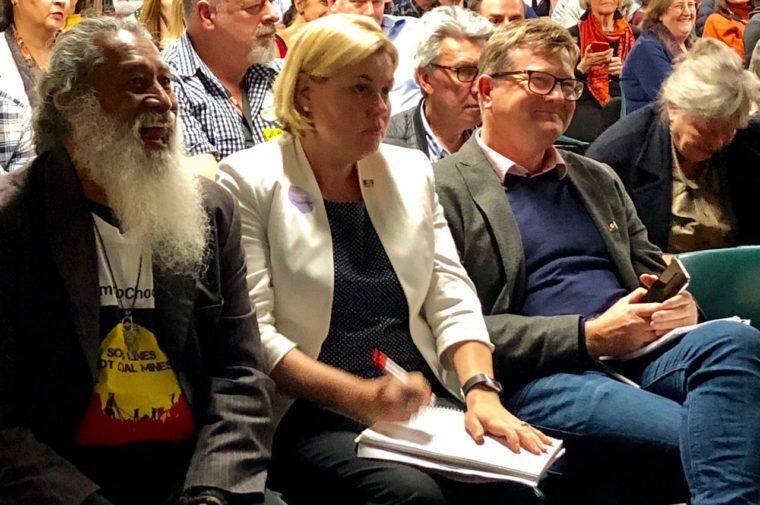 Other speakers also made an impact, in particular, the high profile Wentworth candidate Kerryn Phelps, who has a track record of supporting climate change, refugees and gay rights, but who has chosen to give her preferences to the Libs. The Phelps preferences have confused her would-be supporters, infuriated climate campaigners and thrown a spanner in the works of what the experts said was the only challenger that could possibly beat Sharma. Standing against Phelps and Sharma is Tim Murray, the Labor candidate, The Greens’ Dominic Wy Kanak and a bevy of independents – 16 candidates in all. If that sounds confusing, by Thursday things got worse. And there were pings of hostility in the air. Simple questions in normal times seemed to be inciting a kind of controlled fury. GetUP! was hammered in a comment at the back end of Susskind’s story by sustainability advocate and influencer Michael Mobbs who then tweeted his views to followers, furious that the activist campaign group had preferenced independent Kerryn Phelps. Instead, it told The Fifth Estate that it’s letting people make up their own minds. It’s issued a four-way bet on how to vote. That’s right, four different options in one how-to-vote card. And then another card with a three-way vote. Yep. Four and three. It looks to us like the first time in history that GetUp! has not been absolutely clear in the directions it’s giving. When we called, it was mid-afternoon Thursday and the group had just completed and filed a media release in the minutes before we finally got through to one of the media spokespeople. The official line was that this election was a vote for climate and voters would decide for themselves what that would look like. “Wentworth voters are screaming for a way to make politicians combat climate change so GetUp has responded,” GetUp campaign director Miriam Lyons said in the MR.
She said one in 10 voters in Wentworth are GetUp members and volunteers have so far made more than 30,000 calls to voters to highlight the Liberal Party’s lack of a climate policy. There is an information pack of drop down boxes on the site to help, with details of candidates’ positions. A psephologist has been engaged, we were told. But even for an election expert, this isn’t an easy job. There’s not just the preferences to understand but the “optics’ of how GetUP! will appear to its supporters when it gives an option to a candidate whose preferences go to the Libs, first. Here’s how we understand the preferences from what we gather from the experts such as Joe Hildebrand, former ALP senator Stephen Conroy, and former Fairfax ace political journo Margo Kingston (who had chipped in with the Twitter scrap with Mobbs and told us she’d “dropped everything” to support Phelps on this critical election). Labor has no chance of winning this election, they say. It’s a powerful conservative seat with 16 per cent, maybe 18 per cent, majority. The only possibility of snatching this from the government (destroying its majority) is a strong independent; one that could win a protest vote against the government on climate issues; even better if they look and feel like a Lib. That’s what Phelps has reasoned. As Kingston has explained it below in an extended tweet that she posted, the preferences start being distributed from the bottom. So the candidate coming last sends their preferences upstream so to speak all the way to the top two. One of these has 50 per cent of the vote and wins. She also points to Joe Hildebrand’s well-flagged article to explain the preferences and Stephen Conroy’s argument. Without a substantial Liberal protest vote Sharma wins easily – Labor estimates he needs to fall to a 40 per cent primary vote for Phelps to have a chance. But, if the Greens and other non-Liberal voters preference Labor above Phelps Labor will finish second and Phelps’ preferences will elect Sharma. This is why Labor is not funding its candidate’s campaign and a Labor man is helping Phelps. Who says Labor can’t win? One of the politicos on the hustings was angry at the thought – with Antony Green; the lot. Has Green been to Wentworth, they asked? Has he seen and felt the anger of the people in all the meetings? There’s so much anger, they said. A few people said that. The Libs aren’t taking chances. The rumours are they’ve spent close to $800,000 possibly more. Several letterbox campaigns alone cost an estimated $70,000 to $80,000 each, their opponents say. Other supporters say it’s totally untrue that Labor was not supporting Murray. Tanya Plibersek has several times shown up in the electorate and so has Penny Wong. There were daily strategy meetings, it’s true the ALP is “extremely careful how it spends money” and there was no denying this is a safe Liberal seat so it was an uphill battle at the best of times. Besides, since the 2016 redistribution the seat has possibly become even more conservative with parts of Surry Hills and Paddington taken out of the electorate. “And the fact you and I are even having this conversation is extraordinary,” they said. The latest figures, the source said, was showing the Libs winning by at least 17 per cent. This source sounded the happiest of the lot. Playing the best card of the lot, that of the underdog. People will be surprised at how the preferences will go, the source said. People know it’s just a few months before a general election so they know they can make a protest vote then have a second crack. People at pre-polling booths this week have been asking “really intelligent questions.” And when they made mistakes they asked for fresh ballot papers, the source said. Another confusion is that a second GetUP! front seems to have opened, the Stop Adani faction, which was strongly campaigning at the Bondi Pavilion on Wednesday night, asking for everyone to sign up. Their preferences? Put the Libs last. But the way those preferences are working it sounds, for a non-psephologist, it’s who you put first that will really count. The Fifth Estate is, as we say over and over, nonpartisan. We vote 1 for the Planet every time. All we can say is go the planet! Here’s my attempt to explain the preferencing imbroglio in Wentworth and how to vote strategically to defeat the Libs. Preferences are causing trouble in Wentworth, and if we’re not careful the left will elect the Liberal – a terrible blow for climate change, Nauru refugees, gay rights and lots more. Here’s how they work. Say there’s 10 candidates. The second preferences of the candidate who comes last are distributed up, and so on until one candidate has more than 50 percent. In Wentworth there is no doubt that the Liberal will come first in the primary count, and stay first unless the candidate who comes second can harvest preferences from the other candidates. The only candidate with a chance to beat him is independent Kerryn Phelps. This is because she is the candidate liberal voters upset with the Government will vote for, because she is a small “l” liberal who has pledged not to bring down a Liberal government, but instead to vote down bills her electorate doesn’t like, and advocate for climate change and other progressive issues. But, if the Greens and other non-Liberal voters preference Labor above Phelps, Labor will finish second and Phelps’ preferences will elect Sharma. This is why Labor is not funding its candidate’s campaign and a Labor man is helping Phelps. So what is the Liberal Party’s $1 million strategy to keep Wentworth? Blast Kerryn as a Labor-GetUp! stooge determined to bring down the Government. Plan – suppress the liberal protest vote so she finishes third. And what is the strategy of the Greens? To preference Labor above Kerryn, suppressing her progressive vote so she finishes third. So we have the tragic unholy alliance of the Liberals and the Greens determined to elect Sharma. Why? Because Phelps stuffed up by appearing to recommend putting the Liberals last on her how to vote, making it certain she’d be portrayed as a Labor front by the Libs. To keep the liberal protest vote she then flipped to save her candidacy, outraging the left. Of course she should have said from the beginning that she would not recommend preferences, but she didn’t and now appears doomed. The only way for progressives to stymie the Liberal’s strategy and help Phelps’s long shot big to beat the Liberal is to vote 1 for her, or at the very least give her their second preference. Here’s three links explaining why Phelps is the only chance to win and why preferencing decisions by non-liberal voters are crucial to her chances.